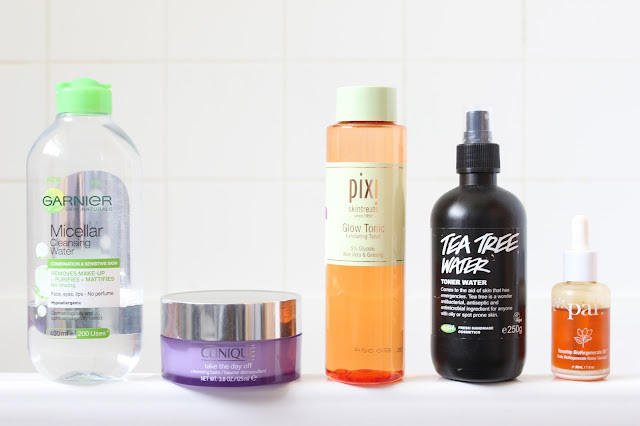 Micellar Water has quickly become a cult classic with near enough every skincare brand stock a bottle of the stuff. The party and lazy girls favourite method of removing makeup, with it's no rinse formula. Just a few sweeps of a cotton pad, it removes dirt and makeup quickly and effectively. I use the budget friendly cleanser as the first step in my evening skincare routine. The formula is gentle enough to use on the eyes and lips. And doesn't strip the skin, or leave it feeling tight. Regular cleansing keeps the skin clear and Clinique's Take The Day Off Cleansing Balm is great for a deep cleanse. Its functional, no fuss, and non-drying, non-greasy, lightweight, removes even the toughest waterproof makeup, formulated with no nasties, nourishing and suitable for all skin types. Clinique's Take The Day Off Cleansing balm is the second step in my cleansing routine. Taking a small amount, I use my fingertips to massage the balm onto dry skin and rinse with lukewarm water. Once water is applied the solid balm melts into a silky white milk. After patting my skin dry, it feels thoroughly cleansed, clean and amazingly soft. Take The Day Off is just as good as Emma Hardie's Moringa Balm (although EH smells pretty darn good) and the Oskia Renaissance Cleansing Gel, which had the tendency to leave my skin feeling a little greasy. One word of warning though, try not to open your eyes when removing eye makeup, as you will be left with cloudy vision for the following five minutes! Some find that toning is an unnecessary step in their skincare routine, but a well-formulated toner can be hugely beneficial to the skin and is an easy step to incorporate into your routine. Twice weekly I like I reach for a liquid exfoliant - Pixi Glow Tonic (contains gycolic acid 5% - AHA). Now I had my reservations, but this tonic effectively removes dull skin cells to reveal a glowing complexion, kicking my dull complexion to the curb. After application my skin feels smooth and refreshed and appears more radiant. And with continued use it helps to gradually diminish signs of imperfections and scarring. But it's important not to overdo it. And personally I find that whilst this exfoliant doesn't leave my skin pink, if used on a daily basis it can be a tad drying. My go-to toner is LUSH Tea Tree Water. With blemish fighting and clarifying ingredients, such as tea tree oil and grapefruit, this toner not only removes any traces of cleanser, it also reduces redness, calms and prevents breakouts. Typically I use this toner after cleansing, but it can be used anytime of day. I like to spritz the tea tree water directly onto a cotton pad and swipe all over my face and it leaves my skin feeling clean and refreshed. This facial oil has become my go-to nighttime treatment. Used alone on freshly cleansed skin before I hit the hay, the organic, natural and unaggressive orange oil from Pai immediately improves my skins texture, whilst helping to protect and maintain moisture, softness and elasticity of the skin. Concentrated with a blend of natural and organic ingredients, it's a great all rounder and perfect for sensitive skin. With continued use, it helps reduce hyper pigmentation and is affordable to at just £22.00. What products feature in your evening skincare routine?